The Grob G 120TP is a military trainer aircraft used for basic and advanced pilot training as well as aerobatic manoeuvres. Image courtesy of Grob Aircraft / photographer: Christoph C. Schubert. A close front view of the Grob G 120TP trainer aircraft. Image courtesy of Grob Aircraft / photographer: Christoph C. Schubert. 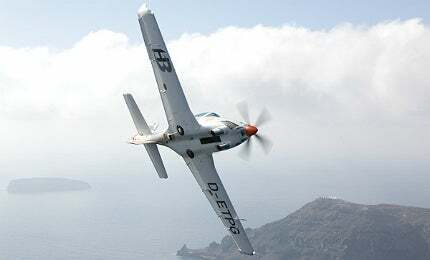 The G 120TP trainer performing aerobatic flight manoeuvres at Santorini, Greece. Image courtesy of Grob Aircraft / photographer: Christoph C. Schubert. A Rolls-Royce 250-B17F turboprop engine powers the Grob G 120TP trainer. Image courtesy of Grob Aircraft / photographer: Christoph C. Schubert. The G 120TP trainer is fitted with Martin-Baker ejection seats. Image courtesy of Grob Aircraft / photographer: Christoph C. Schubert. The G 120TP has a maximum operating speed of 245kt. Image courtesy of Grob Aircraft / photographer: Christoph C. Schubert. The Grob G 120TP is a two-seat, single-engine military trainer aircraft manufactured by Grob Aircraft. It offers a cost-effective military training solution for the air forces. The G 120TP is intended for basic and advanced pilot training missions, as well as aerobatic manoeuvres such as spins, loops, rolls, stall turns and outside turns. The G 120TP trainer made its first flight in the first quarter of 2010. The Indonesian Air Force is the launch customer of the aircraft. Other major customers include Argentine Air Force, Mexican Air Force, Myanmar Air Force and Royal Jordanian Air Force. The Indonesian Air Force placed an order with Grob Aircraft for the delivery of 18 G 120TP trainer aircraft, in September 2011. Deliveries began in 2012 and were complete by 2014. The Myanmar Air Force received 10 new G120TP turboprop trainers from Grob Aircraft by July 2015. The semi-monocoque design of the G 120TP incorporates an all-composite, carbon-fibre airframe and wings offering low fatigue. The composite airframe reduces maintenance requirements and offers a high structural service life of 15,000h. Developed as a completely new aircraft, the G 120TP integrates turboprop engine providing high performance. The aircraft integrates a robust retractable landing gear and low tailplane design. The G 120TP is certified for IFR day/night operations. The aircraft weighs 1,550kg in aerobatic configuration. The maximum take-off weight of the aircraft is 1,590kg. "The G 120TP trainer made its first flight in the first quarter of 2010. The Indonesian Air Force is the launch customer." The cockpit of the G 120TP accommodates an instructor pilot and a student pilot in side-by-side arrangement. The crew are seated on Martin Baker Mk.15B fully automatic lightweight ejection seats. The cartridge activated seats allow the safe escape of crew at various speeds and altitudes. The glass canopy offers all round visibility for the crew, while improving safety during aerobatic training. The cockpit also integrates twin hands-on throttle-and-stick (HOTAS) controls and real or simulated panel switches, identical to those of advanced mission aircraft. The seating layout allows the instructor pilot to easily monitor the trainee’s operation, and use the same controls and displays to establish all stages of the training. The G 120TP’s cockpit incorporates the Cockpit 4000 avionics suite from Esterline Technologies. The Cockpit 4000 is a fully integrated avionics suite, including two AMLCD primary flight displays, a tactical situation display, communications / navigation, engine management, stores management, collision avoidance system, weather detection system and a Virtual Tactical Training System (VTTS). "The semi-monocoque design of the G 120TP incorporates an all composite, carbon fibre airframe and wings offering low fatigue." The VTTS is composed of virtual radar, virtual radar warning receiver, tactical situation display, virtual stores management system and virtual avionics activation panel, similar to those in front line fighters. The open architecture simulation of the G 120TP delivers an ideal training solution for student pilots undergoing initial and basic flight training. Grob Aircraft selected Frasca International’s flight simulation technology and expertise for the new Grob G 120TP-SIM flight training device (FTD) in June 2015. The virtual training system increases flight safety by minimising the deployment of additional trainer aircraft or operational weapon system inside training airspace due to its virtual targets. The G 120TP trainer is powered by a Rolls-Royce 250-B17F turboprop engine driving a five-bladed, constant-speed MT propeller. The engine develops a maximum power of 456shp. The maximum continuous power (MCP) of the engine is 380shp. Rolls-Royce delivered the first two M250 engines for G120TP trainer aircraft in July 2012, under an order to supply engines for the G 120TP trainers to be delivered for the Indonesian Air Force. The engine eliminates the requirement of aviation gasoline (AVGAS) as it burns jet fuel. The G 120TP trainer can operate at a maximum altitude of 25,000ft. The rate of climb of the aircraft is 2,772ft/min. The take-off and landing distances of the aircraft over 50ft obstacles are 374m and 497m respectively. The G 120TP has a maximum operating speed of 245kt. The maximum cruise speed when flying at 10,000ft altitude is 237kt. The maximum range of the aircraft is 735 nautical miles. The aircraft can remain airborne for a maximum duration of six hours. Mako is an advanced trainer and light combat aircraft developed at the EADS Military Aircraft facility based in Munchen, Germany. The G120A is a single engine basic trainer and aerobatic aircraft designed and developed by Grob Aircraft of Germany.